Tell your doctor right away if you have any serious side effects, including: blurred vision, mental/mood changes (e.g., agitation, confusion, depression, hallucinations), easy bleeding/bruising, enlarged breasts, severe tiredness, fast/slow/irregular heartbeat, signs of infection (such as sore throat that doesn't go away, fever, chills), severe stomach/abdominal pain, dark urine, yellowing skin/eyes. List Zantac side effects by likelihood and severity. Before using this medication, tell your doctor or pharmacist your medical history, especially of: a certain blood disorder (porphyria), immune system problems, kidney problems, liver problems, lung diseases (e.g., asthma, chronic obstructive pulmonary disease-COPD), other stomach problems (e.g., tumors). 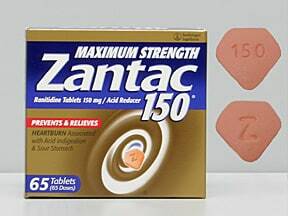 What should I know regarding pregnancy, nursing and administering Zantac to children or the elderly? Does Zantac interact with other medications? This medicine is a blue, pentagon, film-coated, cool mint, tablet imprinted with "Z" and "150". This medicine is a dark pink, pentagon, film-coated, tablet imprinted with "Z" and "150". 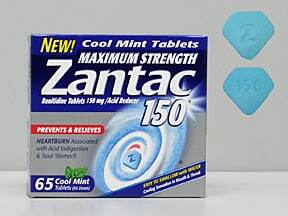 Have you ever purchased Zantac?